Before the invention of the IC, electronic equipment was composed of discrete components like transistors, which serve as both switches and amplifiers; resistors, which impede the flow of electrons; and capacitors, which store them. 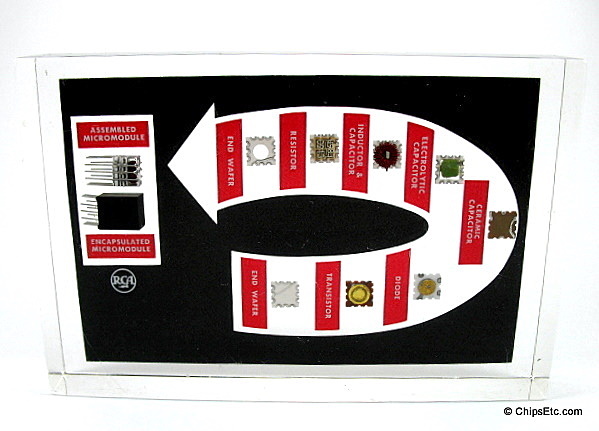 These components, often simply called "Discretes", were manufactured separately and were wired or soldered together onto Masonite-like circuit boards. Discretes took up a lot of room and were expensive and cumbersome to assemble, so engineers began, in the mid-1950s, to search for a simpler approach. It wasn't until 1947, with the invention of the transistor by Bell Telephone Laboratories, that the vacuum tube problem was solved. 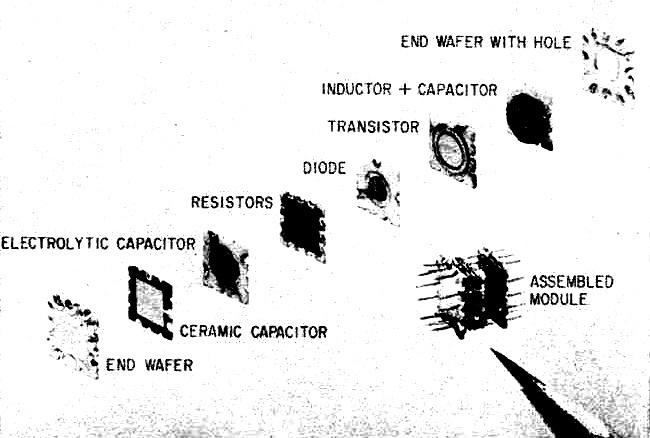 Transistors were miniscule in comparison, more reliable, longer lasting, produced less heat, and consumed less power. The transistor stimulated engineers to design ever more complex electronic circuits and equipment containing hundreds or thousands of discrete components such as transistors, diodes, rectifiers and capacitors. But the problem was that these components still had to be interconnected to form electronic circuits, and hand-soldering thousands of components to thousands of bits of wire was expensive and time-consuming. It was also unreliable; every soldered joint was a potential source of trouble. The challenge was to find cost-effective, reliable ways of producing these components and interconnecting them. One attempt to find a solution to this problem was the Micromodule (also know as a Micro-module) program, sponsored by the U.S. Army Signal Corps. The idea was to make all the components a uniform size and shape, with the wiring built into the components. The modules then could be snapped together to make circuits, eliminating the need for wiring the connections. The micromodule system called for piling tiny wafers of discrete components on top of each other like dishes. Connecting wires ran up the sides of the stacks through holes in the wafers. 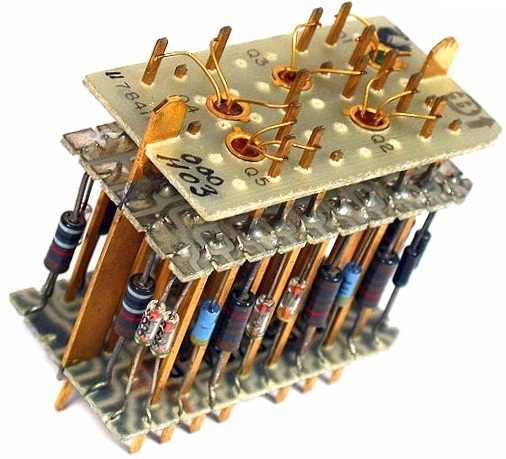 Micromodules were not only easier to make than conventional electronic systems, they were also a good deal smaller: a six-component module was about the size of the sharpened cone of a pencil. In 1952, G. W. A. Dummer of England's Telecommunications Research Establishment proposed "With the advent of the transistor and the work in semiconductors generally, it seems now possible to envisage electronic equipment in a solid block with no connecting wires." In the summer of 1958, a young engineer by the name of Jack S. Kilby went to work for Texas Instruments, which by then had earned a reputation for itself as an innovative manufacturer of transistors. Kilby was slated to work on TI's micromodule program, but the army's system seemed to him to be unnecessarily complicated. He wondered whether it would be possible, instead of stacking discretes on top of each other, to fabricate all the electronic components - transistors, resistors, and the like - out of the same piece of material. It occurred to him that a properly engineered slice of germanium might be made to act as a whole slew of components, much as a tapestry can be embroidered with any number of designs and colors. With Kilby's new invention, the modern Integrated circuit was born, and micro-module technology would soon become obsolete. It looked like a fountain pen, albeit a fat one, but it was really a radio. The U.S. Army liked it, not just because it was very small for a radio, but because it introduced a new concept in circuit packaging—small size and uniform construction. RCA's Surface Communications Division showed this pen-size radio to the U.S. Army in October 1957, shortly after the Russians launched Sputnik, and demonstrated that the world's leader in technology, the Americans, were way behind. At a time when the American military was desperate to catch up, this ultimate in packaging density, called a micromodule, could be just the answer. The Army loved the concept. In April 1958, it awarded RCA a $5 million contract in what became known as the Micromodule Program. Just a few months later, in January 1959, RCA's Aerospace Communications and Controls Division built a stable inertial-guidance platform using micromodules. And just two months after that, in March, at the annual show and convention of the Institute of Radio Engineers (an IEEE predecessor), at a joint press conference with the Signal Corps, RCA announced the commercial availability of Micromodule Designer's Kits for breadboards. Then, in July 1959, the Army added $2.4 million to RCA's contracts—for new microelements, as they were called—and for higher-temperature capabilities for some elements. 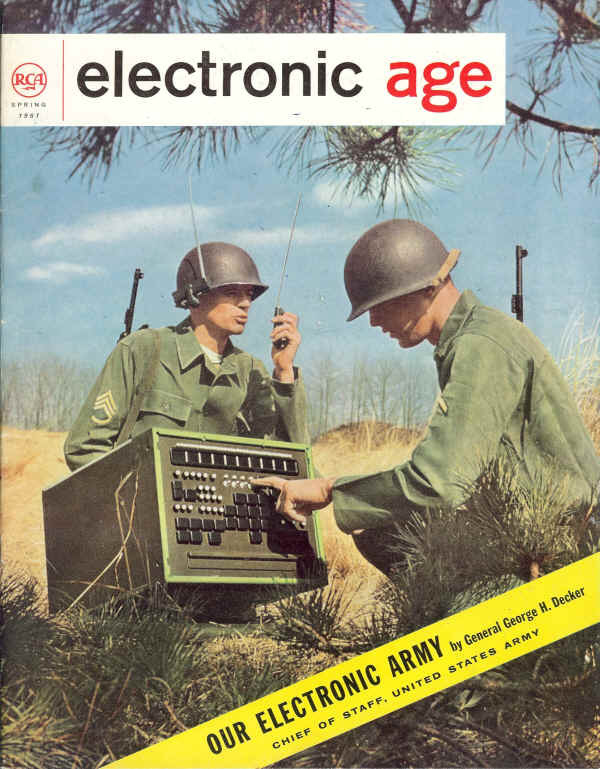 In February 1960, the Army added $8 million for demonstration helmet radios and miniature computers. The micromodule, as the package was called, was fundamentally akin to the short-lived Project Tinkertoy, which the Navy funded in 1951. Tinkertoys were based on using 5/8-inch-square ceramic wafers, each of them bearing a discrete component. That concept was the brainchild of Robert Henry at the National Bureau of Standards. The Micromodule Program was to use smaller ceramic wafers, 0.36-inch square, with three solder ridges along each edge. These squares were stacked and interconnected by riser wires soldered to those solder ridges, where appropriate. The entire module could be encapsulated and, depending on the circuitry involved, might be from 0.4- to 0.8-inch high. Modules could be designed for almost any system. Production of a wafer element could be automated. Individual microelements might contain almost any component. While RCA was the prime contractor, more than 60 producers participated in developing individual microelement components and wafers. And here was another advantage. Individual suppliers became component specialists and experts. 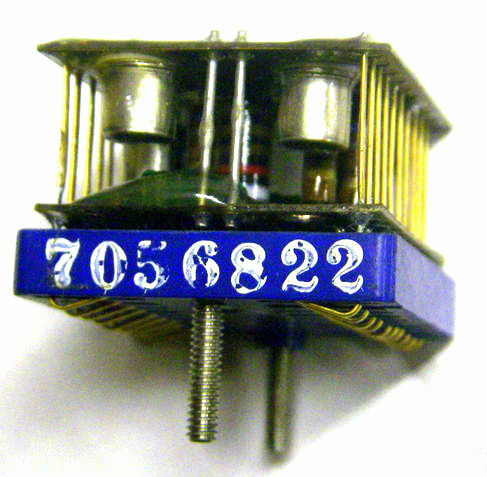 Some companies would specialize in film capacitors; others would do aluminum or tantalum electrolytic capacitors; still others would offer thin-film or thick-film resistor networks; inductors; trimming potentiometers; and bare transistor chips (called "dot" transistors). 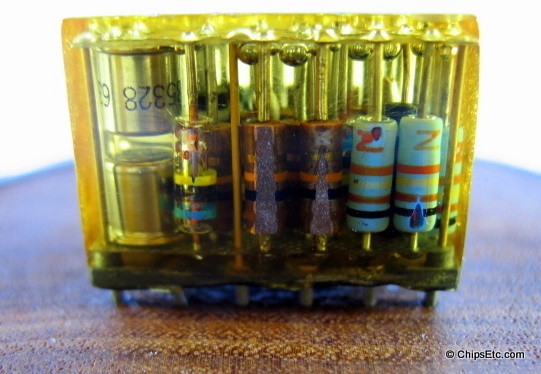 The top-most wafer could support a socket for a miniature 7- or 9-pin vacuum tube, but that feature was never used, as transistors were already in widespread use. It was more than obvious that the micromodule was the circuit package for the future. It was more expensive than conventional printed-circuit packages, but follow-on costs, like maintenance and logistics (including storage, handling and training) were lower. The initial cost was indeed higher. 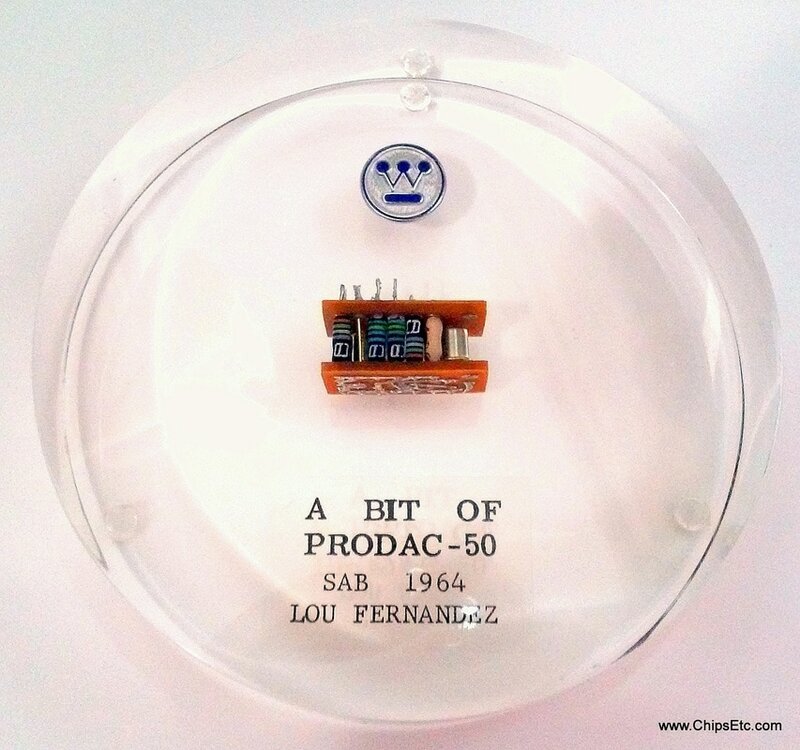 In 1962, a 10-component micromodule cost $52 compared with $20.45 for a printed-circuit-board equivalent. But micromodule costs were expected to plummet with increased production in 1963 and 1964, with costs approaching or even slipping below conventional-package prices, and declining rapidly beyond that. Reliability soared. Based on millions of testing hours, RCA reported that the micromodule proved to be six times as reliable as conventional military circuits and 60 times as reliable as tube circuits, still widely used. Most wonderful, circuit density was beyond the wildest imagination of a few years earlier. RCA's helmet radio had the equivalent of 210,000 components per cubic foot. And the future might see packages with a staggering 600,000 parts per cubic foot. This was a remarkable contrast to 100,000 parts per cubic foot in the most advanced conventional circuitry. For once, the future was clear. In August 1962, the Army's chief signal officer, Major General Earle F. Cook, reported that the micromodule program had proved so successful that the Army's deputy chief of staff for logistics had issued a directive to "take prompt and positive action to incorporate the micromodule concept as appropriate." Cook reported that the Army expected to commit $8 million for micromodule equipment in fiscal 1963, about double the 1962 funding. Some $18 million had already been invested in the program. In his 1962 report—at a joint press conference with RCA—Cook looked back fondly at the March 1959 Signal Corps-plus-RCA press conference when the micromodule was introduced to the world with great expectations. As he listed a large number of micro-modularized equipment that was to be purchased, Cook expounded on the great benefits already realized as a result of the micro-module revolution since that 1959 press conference. Cook did note that the micromodule would accommodate advanced integrated circuitry, "logically, through evolution, rather than by revolution. Such developments," he said, "normally mature bit-by-bit over a protracted period of time, rather than suddenly appearing as an entire operational system. The industry anticipates a long period of applications of the new devices in hybrid combinations with conventional components." Cook was clearly aware that the "advanced integrated circuitry," which micro-modules would accommodate through evolution over a protracted period of time, were beginning to attract some attention. But he may not have been aware of another press conference that took place in March 1959, possibly just a few doors from the Signal Corps-RCA press conference. That's when Texas Instruments announced the work of an engineer, Jack Kilby, who had joined the company a year earlier. Kilby had developed what TI called a "solid circuit," and what TI hailed as the ultimate in micro-miniaturization. Kilby, it turned out, had a great deal to do with the fact that micromodules did not accommodate advanced integrated circuitry. In fact, Kilby was a trigger for the demise of the micro-module program. Instead of mounting individual components on individual ceramic wafers, Kilby thought it would be nice to manufacture all circuit components in one operation with one material. He was not the first to harbor that idea. Others included G.W.A. Dummer of the Royal Radar Establishment in England who, in 1952, spoke of the possibility of blocks of equipment with no connecting wires. At its March 1959 press conference, TI introduced two Kilby "solid circuits," a two-transistor flip-flop and a one-transistor phase-shift oscillator, each at $450. (Competing thin-film modules cost less than $50, so the solid circuit appeared to have a future only where cost was not a consideration.) 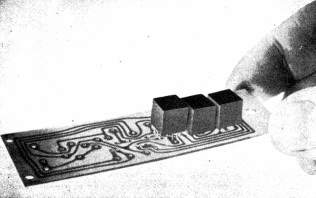 Each solid circuit was built on a single semiconductor chip. Within a year, TI had a line of six solid circuits—all in flat packs—including gates and flip-flops. The dual-inline package, invented by Bryant C. (Buck) Rogers at Fairchild, came later. Though the name "solid circuit" didn't stick, "integrated circuits", as such devices came to be known, did have a rather successful future, even surpassing TI's declaration in 1959 that these products "represented the ultimate in micro-miniaturization." Shortly after TI's introduction of these ICs, Fairchild became the second vendor, with IC's invented by Fairchild co-founder Robert Noyce, based on the planar process developed by Fairchild's Jean Hoerni. These IC's and those that followed from many vendors, all using the planar process, took over the world and killed the micromodule program. Yet the micromodule program was a huge success. While the program lasted, micromodule packages accommodated 675 different circuits. In 1963, micromodule production at RCA alone reached a peak of 10,000 units a month. And micromodules met or surpassed all the initial goals. By late 1964, the initial enthusiasm for micromodules was gone and there were no further major commitments. The early hesitancy in adopting integrated circuits was replaced by eagerness as prices plummeted. ICs began to flourish as micromodules began to vanish. Portable electronic computers and tiny helmet radios, like those shown, may be standard equipment for the soldier of the future. Both devices represent possible applications of RCA's micromodule concept for shrinking electronic components. 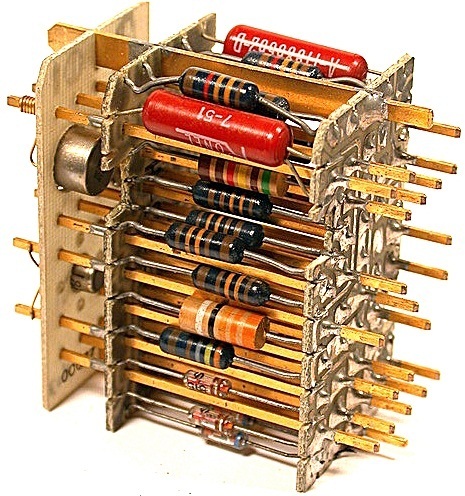 Some computer makers such as Univac, Westinghouse & Burroughs used plug-in type Modules that allowed multiple discrete Transistors, Resistors and other electronic components to be efficiently arranged inside. An array of these small modules were plugged into printed circuit boards allowing for even greater density than the earlier technology which mounting the components individually and spaced apart on a circuit board.